Steve Griffin | The Salt Lake Tribune Gov. 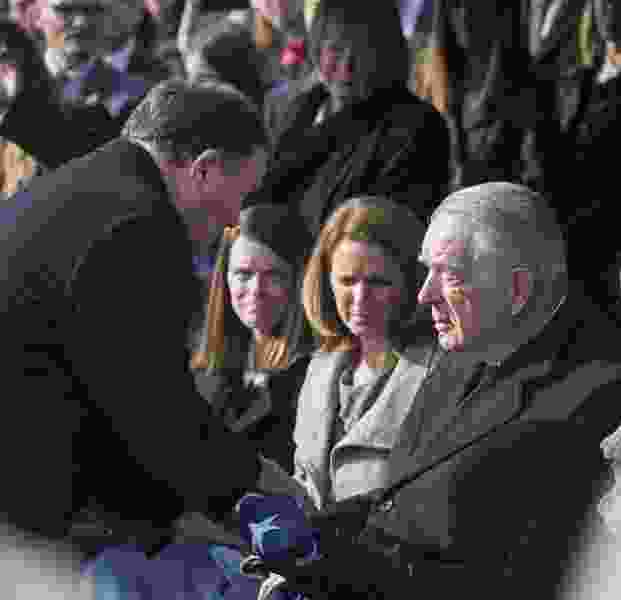 Gary Herbert, left, presents Myron Walker with the American Flag that was draped over the casket of his wife and former Gov. Olene Walker during graveside services Friday, December 4, 2015. Myron Walker, husband of the late Gov. Olene Walker, died Monday. He was 90. Myron Walker, a successful business executive, stood by his wife’s side as she made history twice on the political stage — first as Utah’s first female lieutenant governor in 1993 and then as governor in 2003. Walker friends and family took to calling him Utah’s “first lad,” apparently deciding first gentleman sounded a bit stuffy. The president of Country Crisp Foods, which he ran with his wife, Walker had numerous business leadership posts during his career, including president of the Utah Manufacturer’s Association and president of the National Snack Foods Association. He was a great sports enthusiast and active in tennis, serving at one time as president of the Utah Tennis Association and as a board member of the U.S. Tennis Association. The Walkers married in 1954 and went on to have seven children, 25 grandchildren and 34 great-grandchildren. After filling out the unexpired term of Gov. Mike Leavitt, Olene Walker decided late in the 2004 campaign to run for election in her own right, but was eliminated in the state Republican Convention of 2004 despite sky-high ratings in public opinion polls. When she left office, the Walkers served as international affairs missionaries for the LDS Church in New York City. Olene Walker died Nov. 28, 2015, at the age of 85. A viewing for Myron Walker is scheduled at 11:30 a.m. Saturday. followed by a funeral service at 1 p.m., at the Cottonwood 4th Ward, 5565 Neighbor Lane, in Salt Lake City.